Totnes is a wonderful historical town and the period buildings look enchanting lit up for the season. The town’s extended Christmas shopping is on Tuesday evenings. So, next week why not combine a visit with a festive house warming, prior to visiting the Christmas Night Market. Marchand Petit is holding an open house at The Lembury, Baltic Wharf on 19th December, between 3 pm and 7 pm. Warming mulled wine and hot mince pies are on offer with parking available. 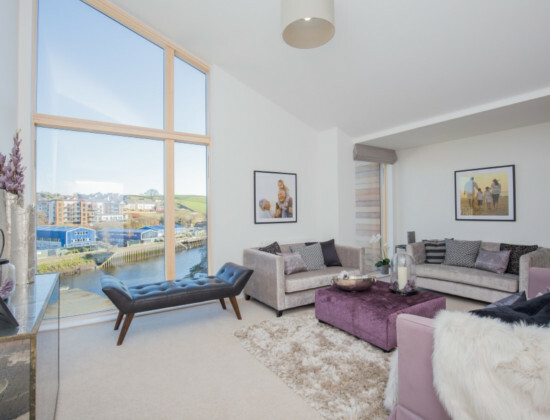 The Lembury is an impressive new build, 4 bedrooms, 2 reception room terraced property with many intriguing features, including full height windows, River Dart views, eye-catching modern design and integral garage. Located just a few minutes level walk from the town centre. This year the Totnes Night Market is run by market traders, with performances from local schools, community choirs, local bands, drummers, lantern parades and a Santa’s grotto. Delicious food, local cider and festive treats all add a magical touch to the Christmas community spirit. So, make a date in your diary to view this stylish property and enjoy the magic of Christmas in charming Totnes. For further information please contact Marchand Petit’s Totnes office on 01803 847979.